It's M's pick for dinner tonight. I know nothing about Brushstroke, but, as always, I'm happy to go along for the ride. 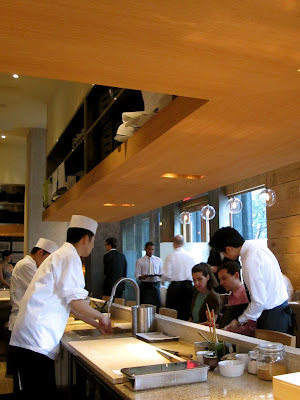 When given the choice between a table or the counter at Brushstroke, we pick the counter so we can have a clear view of the open kitchen -- the sushi chefs directly behind the counter and, in the background, the line chefs. There are flashes of black and white as the waiters and cooks move efficiently and quickly through the stainless steel kitchen. The dining room is minimalist too -- The walls are rough-hewn planks, the tables and chairs are a more refined light wood, and the accent is granite. We both opt for the eight-course tasting menu (It's that, or the twelve-course). Dinner begins with four small plates of lightly cooked fish. I enjoy the delicacy of the dishes and the careful presentation, but I find myself wondering what's next. I haven't been won over yet. Here's the irony of Brushstroke. It's widely considered to be a sushi restaurant. But it's the meat that's spectacular. Oh my god, the meat. 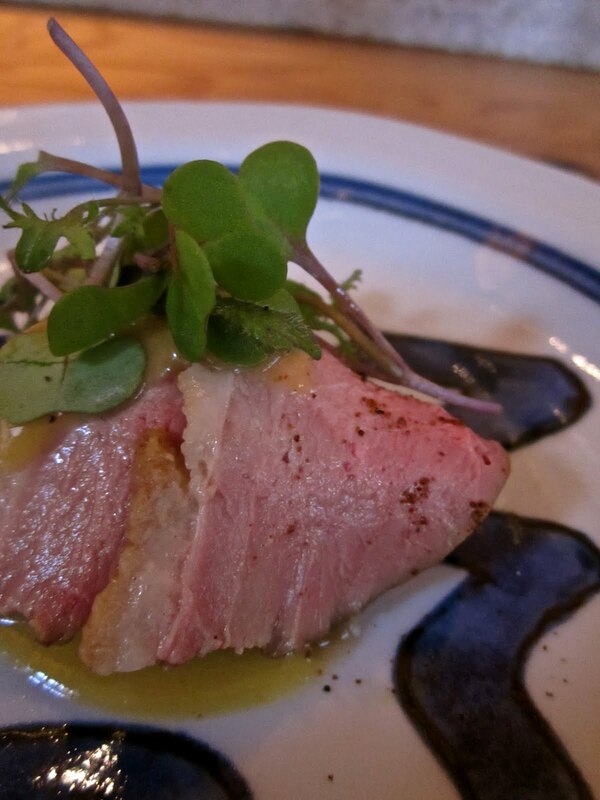 The grilled slices of duck are paired with Japanese eggplant, a miso-mustard sauce, and micro-greens. And, for the first time during the dinner, I want an entree-sized portion. Next up is the stewed pork cheek, with green apple puree and apple cider sauce. You've heard of fork tender, right? Well the pork is chopstick tender. It's rich and it falls apart when I take a bite. The sweetness of the apples makes the dish balanced. 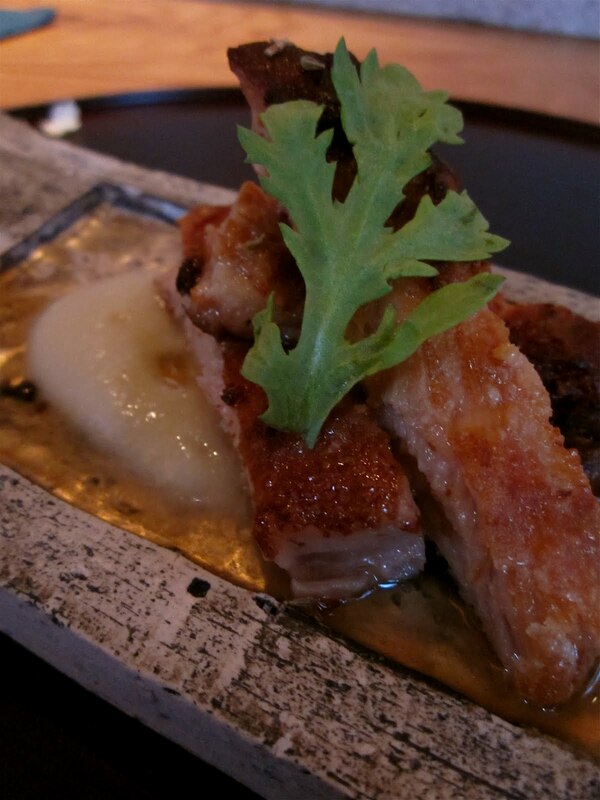 We're a little giddy after two delicious courses, but then we're disappointed by the rice dishes. M's steamed lobster is unappealing and my lightly seasoned raw tuna is good but unmemorable. Dessert is a high note -- soymilk pannacotta with matcha green tea sauce. It is so creamy and sweet. Either the chef added heavy cream or he's making magic with soymilk. And at the bottom of my bowl are sweetened red beans. I immediately think of "fruit at the bottom" yogurt. Would I go back and order the tasting menu again? Probably not. But the aesthetic is refined, the presentation is flawless, and the technique is creative. And, when I peek at the bar after dinner, I want to come back soon. The walls of the bar are made up of thousands of paperbacks. Incredible. I'd like to have an evening in the bar -- I'd order sushi a la carte and talk cocktails with the friendly bartenders. And I'd really like more of that pannacotta. I love that phrase, "chopstick tender." Those pork cheeks were a perfect reminder of how fabulous fat and salt are together, especially with tart green fruit as counterpoint. Sin incarnate--and so delicious! I would go again, just for that dish. But I agree...the bar beckons. I'm not much of a carnivore, but the duck and the pork cheek were just incredible. It's not to say that the fish wasn't good (because it was)... but our waiter even said that the meat is where the chefs get really excited/creative.